You need first and foremost to visit the careers webpage at jobs.hiltonworldwide.com if you wish to apply for a job at Hampton Inn. 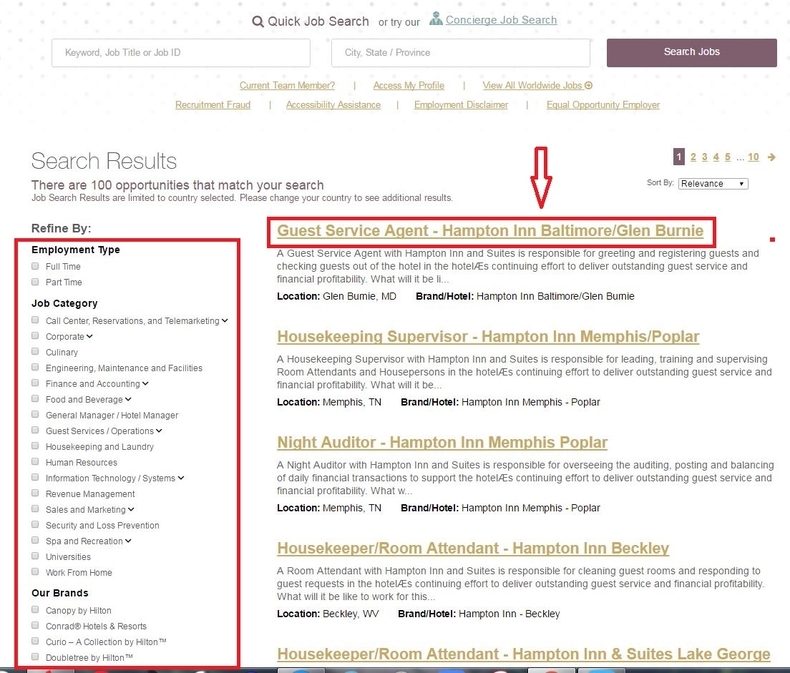 You may type key words such as job title or job ID, or city, state or province in the search bar and click "Search Jobs" to find current Hampton Inn job openings. 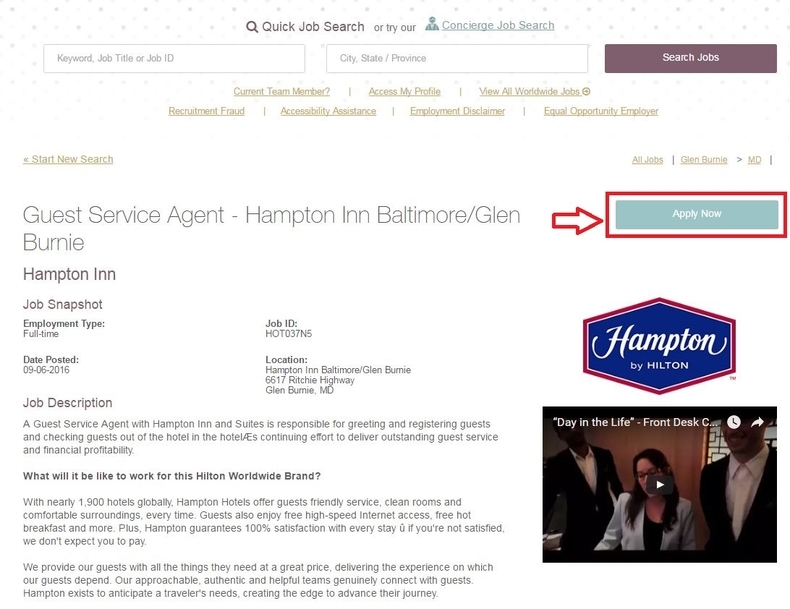 Also, you can find all job opportunities by simply clicking the button "All Jobs at Hampton by Hilton". Here the latter will be taken as an example. A search results page will be shown in this step. View the job opportunities list and select a position in accordance with your interests and qualifications by clicking the job title directly. 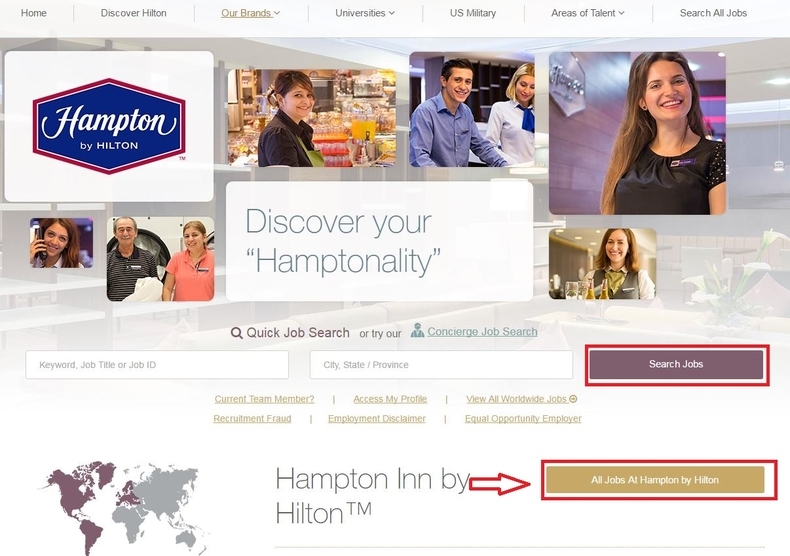 Also you can narrow down the search results scope by choosing the employment type, job category and Hilton brands on the left side of this page. After you click the job title, you will go to a job description page on which requirements, qualifications and duties of this position will be explained in detail. 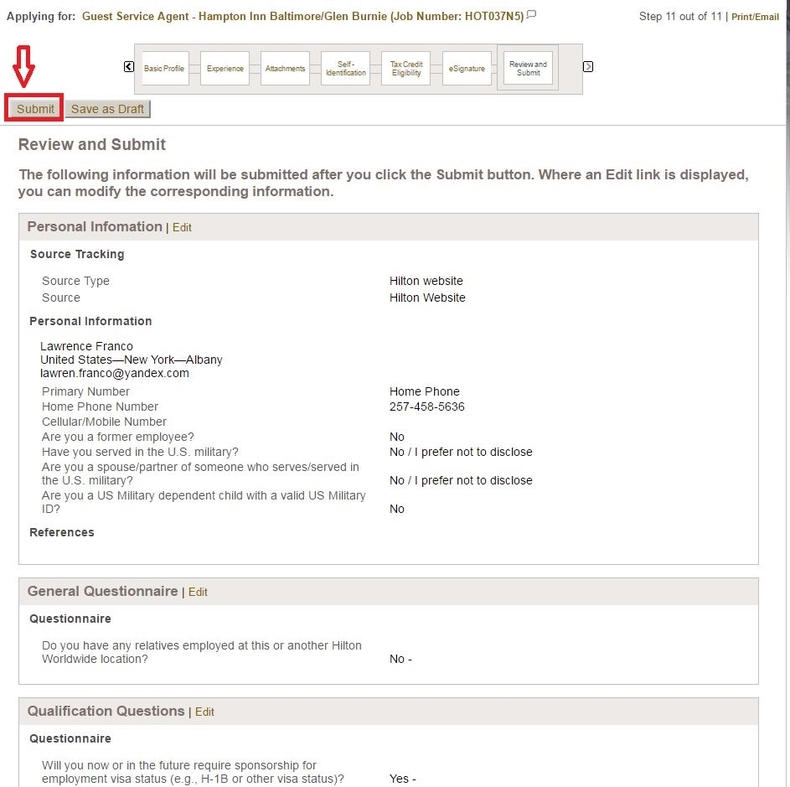 Browse the information carefully, and click the button "Apply Now" to continue if you make your decision to apply for this position, after which you will be asked to accept the privacy agreement. Just read the agreement and click "I Accept" to go to the fourth step. 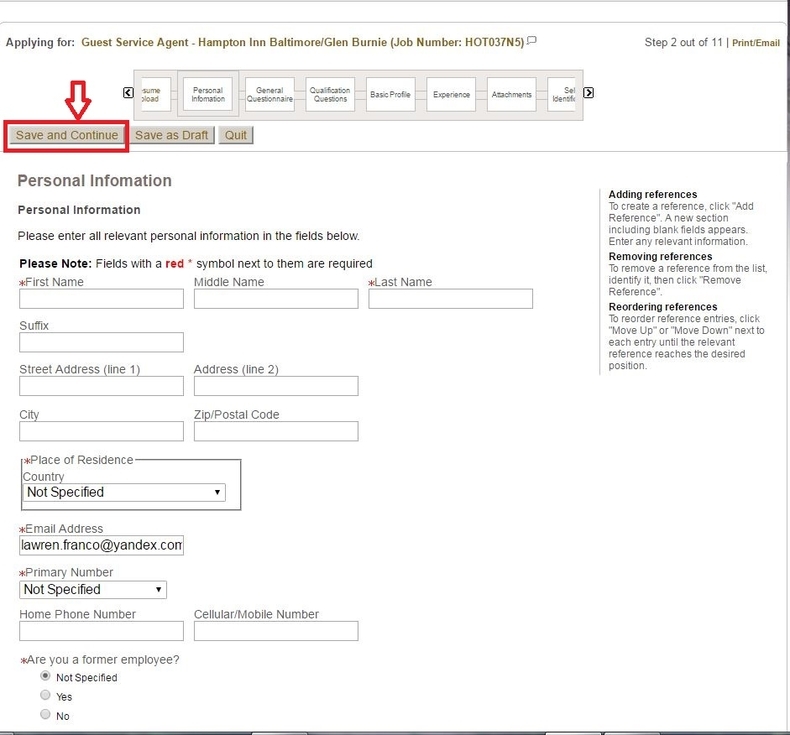 You have to login with your previous Hampton Inn account to further your online application. Enter user name and password in the required fields and click "Login", and you will be logged in. And if you are a new user, you need to build your own account in this step. Click the button "New User" and follow the instructions to get your account created. 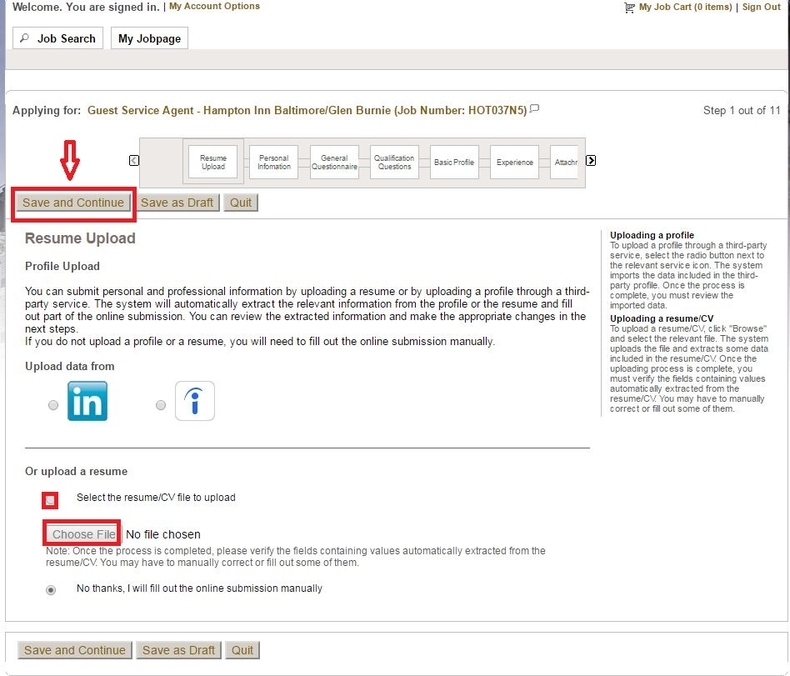 You can upload a current resume from your computer or via a third-party service to submit your personal information, which will make the online submission much easier. But if you'd like to attach your resume or other documents later, you will have to fill out the online submission manually. You are required to provide your personal information in this step. Here your name, place of residence, primary number, email address, references and several questions like "Are you a former employee?" are included. After finishing them, click the button "Save and Continue" to move on. 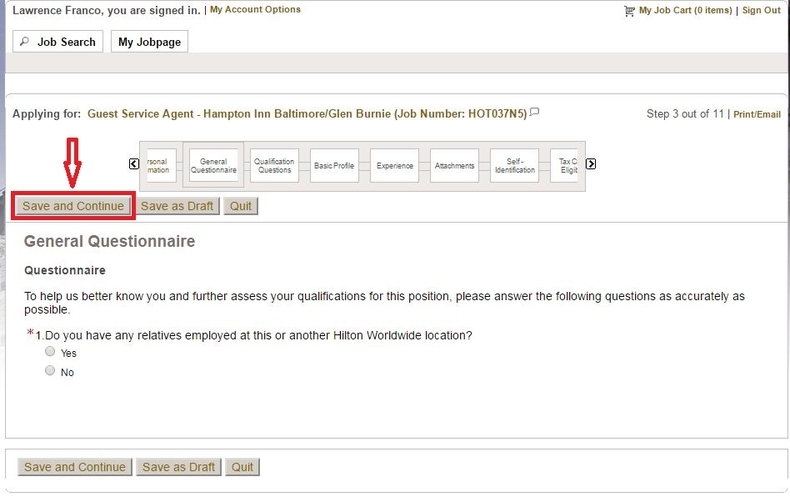 To help Hampton Inn know more about you, you are asked to answer the question "Do you have any relatives employed at this or another Hilton Worldwide location?". Choose "Yes" or "No" according to your own situations and click the button "Save and Continue" to go forward. As you can see from the picture below, a progress bar on the top of this page will tell you which step you are in. There are 7 more steps to be finished. 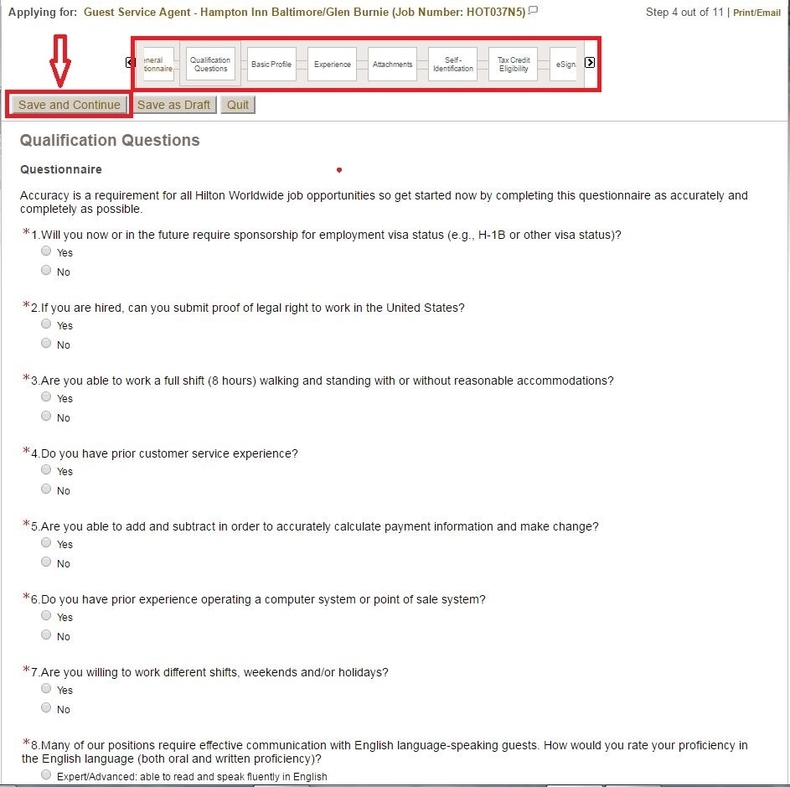 You need to answer 8 qualification questions at first and build your basic profile by filling out your expected job level, shift, schedule, annual salary, etc. Next provide your work experience including your former employer's name, reason for leaving and educational background. After that, you will be asked to attach some relative documents, answer some self-identification questions such as veteran status, gender, disability status and race. Then finish the 8 tax credit eligibility questions and provide your E-signature. When finishing a single step, you can go on to the next one by clicking the button "Save and Continue". After all the steps above are finished, you will enter a review page which requires you to check the information you've filled out before clicking "Submit“. With the nine steps all done, you will come to a "Thank you" page which means you've made your online application completed. Click jobs.hiltonworldwide.com to apply for Hampton Inn jobs online.